Lately, I’ve been deprived of that wonderful, relaxing, consoling thing we all call ‘sleep’. That’s a student’s life for you in a nutshell; a handful of fatigue, heaps of exhaustion, absolutely no rest and lots and lots of sleep deprivation. It’s not all good. Good thing we’ve got bands like the Switches which I can turn my attention to; anything for a few minutes of break from my burdensome life. 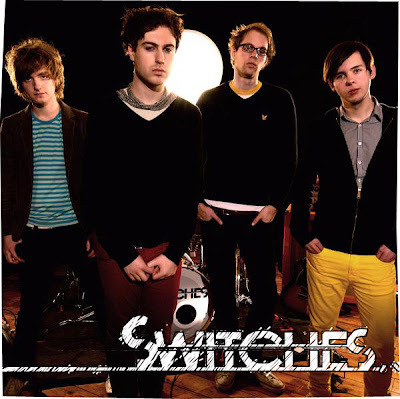 Switches is an Indie rock band from Southend, England who formed quite recently in 2005. The band makes music that leaps out at you and pokes you where you like it the least, making it hard to simply opt for ignorance and not acknowledge it. It’s Indie rock at its boldest and most self-assured; music that combines essence of bands such as the Vines and Kaiser Chiefs topped with some good ‘ol Englishmen preppiness. Crammed with killer hooks and completed by explosive rhythms resulting in songs that are loud, heavy and almost chaotic. When life’s shifting too slow, its music like this that serves you best.